There is something special about a smoked chicken — crisp skin with moist and juicy meat that bursts when you bite into it. There are many methods to smoke chicken, but here are a few techniques that guarantee great chicken every time. Brine, rub, season or marinate your chicken; pick whatever seasoning technique works best. Most of the time, I just prefer to heavily season with salt and pepper. Remember, sugar burns; make sure you don’t add too much sugar to your rub or you run the risk of the chicken skin burning while it’s cooking. Paper towels and oil are your friends. Wipe the bird dry with a paper towel before you season it and especially after you brine; moisture on the outside will actually steam the bird and keep you from getting a crisp skin. Oil helps the seasoning stick, and it aids in the browning. Just before you get ready to cook the bird, dab the skin again to remove moisture that the salt has drawn out, being careful to not rub off the seasoning. Birds do not cook evenly; they need a little help. The wings and legs start out next to the body, but they will pop out during cooking and become overdone before the rest of the bird. Trussing is an easy way to bring all the parts in tight next to the body to cook more uniformly. Bend the wings back and tuck behind the neck. Take a 2- to 2½-foot-long string (depending on the size of the bird), and place it under the tail; leave about a quarter of the string on one side and three-quarters on the other side. Wrap the long end of the string around the tail, then around the legs. Keep the shorter string next the breast of one side and run the longer string around, above the wings and neck, and then back to the shorter string. Pull tight to bring all of the parts of the bird together. Double-knot the string. 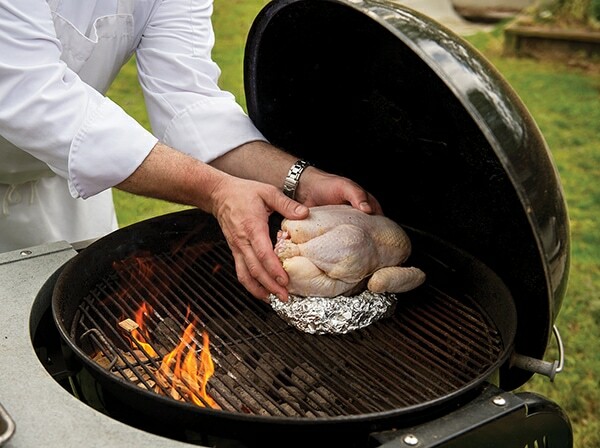 If you use a smoker or grill, place the bird over indirect heat — 250 to 300 degrees. If your heat is too high, the chicken will cook too fast and dry out the meat. 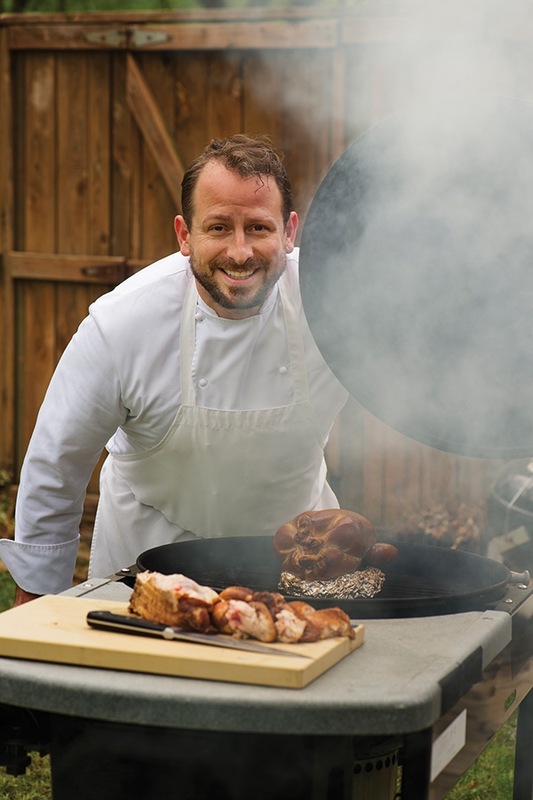 Although using all wood to cook seems like a good idea, it will impart too much smoke. Unless you have a heating element, it is best to use some charcoal. Depending on the size of the bird, it will take between 1½ and 2 hours to cook. Slow and low heat produces a crisp, smoky skin with juicy meat. If you are pyrotechnically challenged or lack the space, you can achieve a similar finish in an oven. Dry and season the bird as you would for the smoker; then rub some liquid smoke (for flavor) and liquid amino acids (to aid in browning) onto the bird and place it into a 250-degree oven for 1½ to 2 hours. Your house will smell great, and you won’t have to light anything. Although the chicken is done when it reaches 165 degrees in the thickest parts, it’s not yet ready to be cut. The heat has pushed all of the remaining moisture away from the surface, and it needs time to redistribute. If you cut into the meat too early, all of the moisture will end up on the cutting board and not in your mouth. Let the chicken rest 10 to 15 minutes after cooking, to give it time for the moisture to redistribute without cooling down too much. After the bird has rested, cut off the twine. 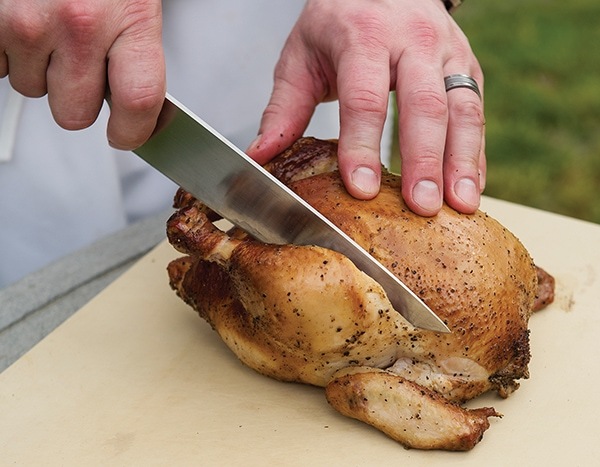 Cut through the skin just to the side of each breast and separate the leg by rotating it toward the back. Once the thighbone has come out of its socket, cut through the back. The wings can be cut from just above the breasts at an angle toward the center. Remove the breasts by cutting just to the side of the breastbone and following the rib cage. The rest of the meat can be pulled off by hand. Smoked chicken is delicious on its own. Make a side of mac and cheese and some collard greens, and you are good to go. Leftover chicken makes great chicken salad or an addition to pasta, stir-fry or soups. Save the skin and bones for an extremely flavorful stock.